The format of a photograph is a standard size or the means to organize and store a photo / digital image. File photo consists of digital data in one format or bitmap image, i.e. a data structure that represents the pixel array of colors displayed on the monitor screen, paper or other display media. The type bitmap image format is technically described by the width and height in pixels and the number of bits per pixel. There are many types of bitmap images which can be used, including GIF, JPEG, BMP, PNG, Exif, TIFF, RAW, PAM, WebP, HDR, RGBE, OFF-GFX, 2D, 3D, CGM, SVG, Compound and Stereo. Although bitmap formats vary, but the most commonly used for online purposes is the types of JPG, GIF or PNG because this format can appear in all types of browsers available on the Internet. If we use a photo / image for the purpose of the website is the best choice JPG and PNG is the most common type of screenshot images, while GIF is suitable for the type of graphic images. JPEG or stands for Joint Photographic Experts Group, is a file type that uses lossy compression. This format supports 8 bits per color of red, green and blue, with a total of 24-bit color, and produces relatively small file sizes. 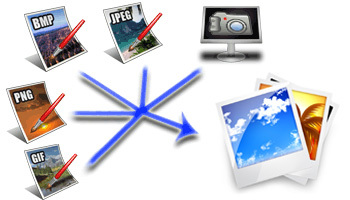 JPEG is also used as a compression algorithm of photo / image in Adobe PDF. GIF (Graphics Interchange Format) is an image format that is limited to an 8-bit palette, or 256 colors only. It uses the lossless compression that is more effective, and if the field has a broad picture of the color will look sharper, suitable for storing graphics with relatively few colors such as diagrams, logos, cartoon pictures or shapes. The GIF format also supports image or animation effects. PNG or Portable Network Graphics is similar to GIF but has many bit colors up to 16 million colors. PNG is better when a photo / image has large areas of uniform color. JPG format is the same as using a lossy compression, and slightly better than JPG when being edited with many (repeated) compressions, PNG is not degraded image, it also produces a smaller file size. All modern browsers in Internet currently fully support PNG. This is the best image format for image quality that has a very large size. If you want to get the best picture quality and do not want to be compressed, it must use the BMP file format. This format is used internally in the Microsoft Windows operating system to display the graphic images it is often called Windows Bitmap. In addition to using the BMP, the Microsoft Windows operating system also uses Windows Metafile WMF format or to keep the line-art, illustrations and content created in drawing or presentation applications. And for the purposes of Microsoft Office applications such as Word, PowerPoint and other, it uses EMF format type (Enhanced Metafile).